The phenomenon of sloshing is a substantial challenge in propellant management, particularly in reduced gravity where surface tension-driven flows result in large slosh amplitudes and relatively long decay time scales. Propellant Management Devices (PMDs) such as the rigid baffles and elastomeric membranes are often employed to counteract motion of the free surface. In the present study, we investigate an active PMD that utilizes a free-floating membrane that, under an applied static magnetic field, becomes rigid and suppresses slosh. This semi-rigid structural layer can thereby replace bulky baffle structures and reduce the overall weight of the tank. 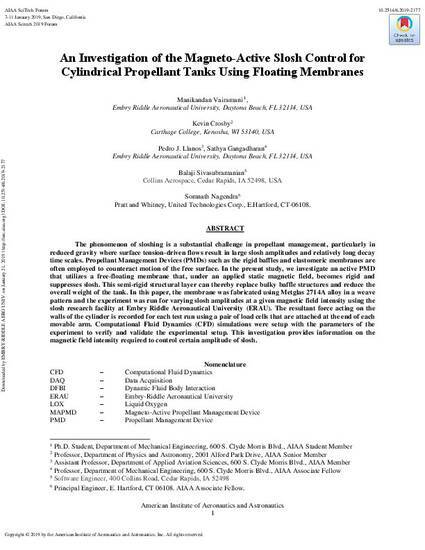 In this paper, the membrane was fabricated using Metglas 2714A alloy in a weave pattern and the experiment was run for varying slosh amplitudes at a given magnetic field intensity using the slosh research facility at Embry Riddle Aeronautical University (ERAU). The resultant force acting on the walls of the cylinder is recorded for each test run using a pair of load cells that are attached at the end of each movable arm. Computational Fluid Dynamics (CFD) simulations were setup with the parameters of the experiment to verify and validate the experimental setup. This investigation provides information on the magnetic field intensity required to control certain amplitude of slosh.